As we approach the weekend of March 18 it is particularly satisfying to report the stable has the best current strike-rate in Victoria with our last four runners all winners. Bubba’s Call started the run with victory at Werribee on February 24, I Boogi scored at Pakenham on March 2, Tea Tree Gully saluted at Kyneton on March 6 and then Lord Sherwood scored at Ararat on March 10. In fact, throw in the win of I Boogi at Ballarat on February 7 and Lord Sherwood at Seymour on February 6 that is six wins from our last nine runners and the only one to miss a place was Bubba’s Call when fourth at Ballarat. 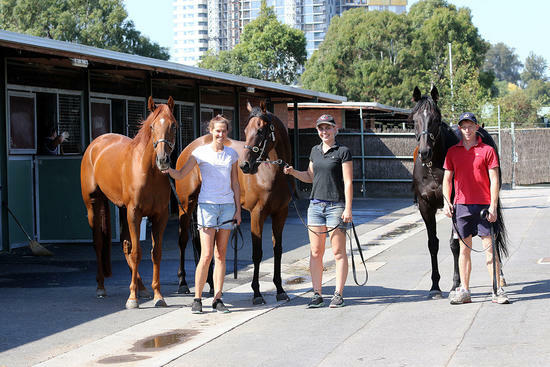 Three of the winners are pictured above, Left to Right Bubba’s Call, I Boogi and Lord Sherwood with Tea Tree Gully missing as he was already in the spelling paddock. It is a great reward for our owners and thanks to all the hard work that goes on behind the scenes from the staff at the stables. “We haven’t really done anything different other than pay extra attention to those little details,” Scott Cameron said. I Boogi gets his chance at Flemington on Saturday in the last race over 1600m and Scott is pleased with the way the four-year-old has trained on since his last start. “His gallop last Saturday was super and he’s just been kept ticking over since,” Scott said. “He’s getting more and more relaxed and settling and it’s showing in his results.